We strive to make the architect’s ultimate vision become reality on every project! Our engineers have a combined experience exceeding 140 years, so we’ve seen it all. Working with project team members from initial project conception to construction drawings and through the entire construction process, we’ve completed hundreds of successful projects of all building types & materials. Regardless of size or complexity, we treat all projects with the same high level of customer service, technical skill and competency. We consider our clients some of the best architects, general contractors, & developers around, not to mention very good friends. Please contact us if there is any way we can help you with your structural engineering needs! This may not be one of our projects, but it makes the point....and 2,500 years in advance we give permission to some Greek engineering firm to use one of our projects on their website. 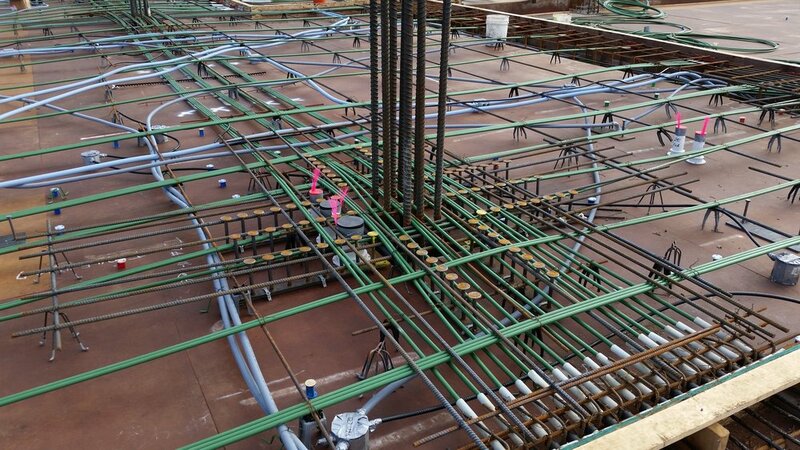 This post-tensioned deck is one of ours...and we'd sure like to know who let the electrician on the site. In seriousness, we enjoy what we do and the clients we work for, love a challenge, and have significant experience designing with modern building materials.